Thirty years ago, this week, I experienced one of the more significant weeks of my life. My grandmother died. The last of my grandparents to have passed away. For a young adult, like me, it was a life marker, an acknowledgement of mortality if still a generation away. I was offered a job, of sorts. Under community employment like conditions I became an Assistant Supervisor at a Glass Recycling Unit run by the Rehabilitation Institute. It was called sheltered employment, but it was far from sheltered. We worked outside for most of the time, throughout the year. It was all very low tech. We stood around a large riddle, armed with goggles, gloves and an awl, to take off the metal rings found at the top of bottles. 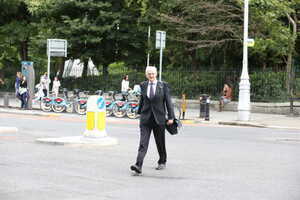 My manager was Conor Counihan, then also captain of the Cork Gaelic Football team. Conor was a hard man on the football pitch. At work he was firm but calm. From him I learned a lot about the art of grace under pressure. As these things happen in threes, this was I also the week I joined the Green Party. I had engaged in a prolonged correspondence (handwritten letters) with the person who held the main officership in the party. A party then, and still to a large extent, that had something of a distaste for leader figureheads, had one first among equals position known as the Co-ordinator. This position rotated every six months. My correspondence with the then Co-ordinator was arrogant in the extreme. It went beyond me seeking from them reasons as to why I should join their party. To somewhat paraphrase myself I wanted to know how the party would make use of my obvious brilliance! On the surface these three events would seem to have little in common, other than occurring at the same time in my life. In retrospect they each represent significant signposts. It helped me recognise and deal with inevitability. It taught me the value of work, particularly physical work. It ingrained in me an invaluable lesson of working with other people. And I have gained by being with those with whom I share values. Those values ever so slowly have informed wider public debate, and in some respects have helped change public behaviour. Frustratingly the realisation that such change has been too little, needing so much more change to be made, hasn’t diminished the holding or strengthening of those values. 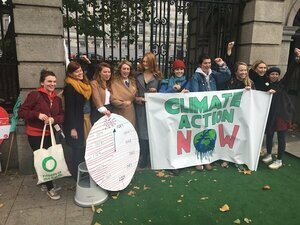 This week I attended a Climate Change Action protest outside of Leinster House. A whole new generation are now taking up the cudgels, being brilliantly led a cadre of young women. They are asking the why of change with the same vehemence we had, but they are addressing the how of change in a far less circumspect way than we have done. If I’m lucky, and if I achieve my Mother’s level of longevity, I may yet see another thirty years of life. I’m hoping that many life lessons lie ahead of me yet. I’m praying, to Gods of no particular religious denomination, that they can be collective lessons. Posted in Misc and tagged Dan Boyle, Dan on Thursday at 9:38 am on October 18, 2018 by Dan Boyle. 30 years of predicting climate catastrophe and how much has come true Dan? Climate changes naturally. It’s the way of the word. Why are you trying to pretend you can control these natural cycles? Can you control the oceans? The sun? After 30 years of indoctrination what have you achieved except the peddling of bad science and the pillage of the public purse for pointless wind farms that enrich the opportunist subsidy farmers and degrade our landscape? Your fear mongering has failed. You have no science, observation or proofs to support your agenda. If you have then share this now or stop this endless propaganda. you sound like fun. want to go let off some some aerosols? I just can’t get over the central contradiction every time he posts a version of this rant. 1. Where is all this climate change they keep talking about? 2. The climate is always changing. NPC Nigel strikes again deliberately distorting and distracting from meaning. (Probably not his fault, it’s his cultural and political programming – Good job Dan! /s). The Climate is always changing (eg: Medieval Warm period, Little Ice Age). Where is the catastrophe the Chicken Licken fantasists keep screaming the alarm about? C’mon Nigel: give us one example from 30-40 years of propaganda… show us finally how bad things really are. you’re not really this stupid, are you? NPC I may be, you Gelatinous Cube, but I can spot a drone demanding STUFF EVIDENCE EXAMPLES DEBATE MEEEEEEf in absolute and utter bad faith a mile off. Last time you gave a link that directly contradicted your central thesis but you rejected bits of it as bad science for no reason whatsoever other than it disagreed with you. SCIENCE! So that’s no then, you have no proof of catastrophe. C’mon Dan, Don’t let your NPCs down. Where’s the proof of all your catastrophe propaganda? After 30 years you must have some! Or is man-made climate change just a silly cult? Leon there is plenty of proof of anthropogenic global climate change, which you will, obviously, reject out of hand purely because it disagrees with your fixed, politically motivated, culturally determined, view. It’s out there. Go find it and reject it if it makes you happy. Do the work yourself, cut out the middle man. Rant and rave about cults and NPCs and bad science like the alt-right drone you are. Then, as proof, link to things that contradict you! It’s what you do. No proof Nigel keeps spinning the cult of lies. CO2 is a nutrient, not a pollutant (but you know this). CO2 emissions are beneficial by-product of wealth creation. Reducing CO2 is a short-hand for reducing your wealth. There is no proof of man-made climate catastrophe. Nigel, Dan and their squad of NPCs continually fail to demonstrate any truth to their dogma. They are attempting to pick your pockets and sell climate indulgences by promoting obsolete technology. Don’t let these lying, thieving climate cultists get away with their un-provable, un-proven dogma. Say ‘NO’ to the cult of man-made climate change. This guy is the most Trump-supporteresque caricature, ever. Also, has no concept that forty years is not a very long time in the grand scheme of things. Sad. Hey algae is a nutrient! Does that mean by definition too much of it is a beneficial by-product? No, it’s a by-product of burning fossil fuels. In terms of wealth, along with most forms of pollution, it is an externalised cost that costs economies millions with the worst effects falling on the poorest. You claim to judge other people’s scientific literacy? No proof Nigel has no proof. His desperate diversions are desperate. Stick to your programming Nigel… You and Dan can keep each other warm and vindicated during the long winter nights ahead. You can cure ignorance, but you can’t cure stupid. *Adds Leon Down to list of usernames I consider to be trolls and who can be fully ignored…. Proof of catastrophe or STFU. 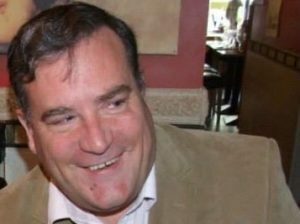 The point is that Dan was once an ordinary working stiff, just like you and me, before he discovered the heady delights of green party membership. Shure he has”nt looked back since. Still in “Sheltered Employment” ? 30pieces of silver more like.